Nintendo's new console is an anomaly in the game console ecosystem, but not for Nintendo. The company that -- in just the last decade -- popularized stylus-powered gaming, microphone-powered gaming and motion-based gaming, is once again pushing game control inputs forward. And just like its previous consoles, lessons learned from past hardware build the foundation of its latest effort: the Wii U and its bizarre-looking, but conventionally named, "GamePad." 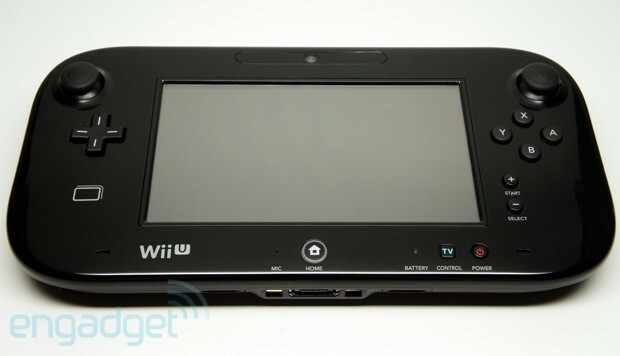 The Wii U console itself, for instance, looks almost exactly like the original Wii. It's longer (10.6 inches vs. 8.5 inches for the Wii), a bit rounder on the edges, and there's an HDMI port out back, but overall it's quite similar to its squatter predecessor. It's enough that you'd get the two confused if they were sitting in the same entertainment center. Naturally, the beefed-up internals and Wii backwards compatibility mean you'll likely be replacing the ol' virtual tennis machine should you choose to pick one up. Of course, the GamePad is the real star of the show here, bolstered by Nintendo's ambitious "TVii" experiment. Everyone's favorite Italian plumber looks super in HD, no doubt, but how software employs the multifaceted touchscreen tablet / traditional game controller hybrid is what really matters. So, how does the Wii U fare? Find out below. How would you rate the Wii U? 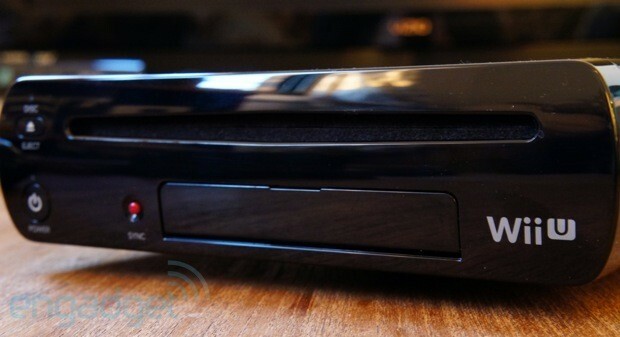 The Wii U is a relatively quiet little box that slips easily into home media centers. Sure, there's a stand (at least in the deluxe set), but we opted to lay it on its side -- it takes up less space, and all the writing is geared toward it laying horizontally. How could we disobey the font? It'll take up yet another HDMI spot on your HDTV (a cable is thankfully included in the Wii U box), though component is also an option (sold separately). Think of the ports on the back of the Wii U box as identical to what you had on your original Wii, save for some very small tweaks. For one, the AC power port is slightly altered to account for the Wii U's new, larger adapter. Otherwise, the only difference is the addition of an HDMI port on account of the console's beefed up internals: an IBM Power-based multi-core processor and an AMD Radeon custom high-def GPU. You can directly plug in that old Wii sensor bar, should you choose to eschew the brand new one you'll get in the box. There are two flavors of storage as well, with the $300 model getting just 8GB of internal flash memory while the $350 model gets 32GB. Not that any of that matters terribly, as both flash and full-on external HDDs are supported. The four USB ports situated around the long black rectangle should provide more than enough support. Should they not be enough, an SD slot sits up front below the optical disc tray, tucked behind a slidable wall of shiny plastic with two of the aforementioned USB ports. 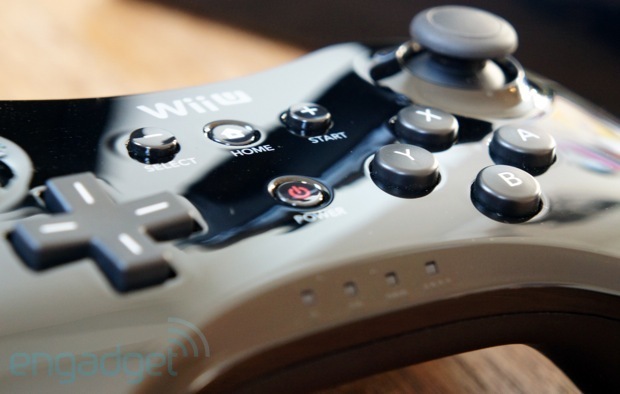 Like the GamePad it supports, the Wii U console is made of glossy, fingerprint-loving plastic. The dust and cat hair in our test apartment love the exterior of the Wii U. We do not. Unless you live in a dust-less vacuum, there's no way your Wii U console won't exist in a state of perpetual shabbiness. We've had our black deluxe set for a week and it looks as though it's been sitting in an ancient tomb. Finish aside, it's a quiet, sleek black rectangle that takes up little of our precious entertainment center space -- you'll find no complaints here. The Wii U's touch-based GamePad controller has its roots in the Nintendo DS, as evidenced by the GamePad's stylus concept, the aging resistive touchscreen (albeit larger at 6.2 inches, with an 854×480 resolution in a 16:9 ratio), and the microphone residing along the bottom. A player-facing camera -- no doubt borrowed from the DSi -- sits parallel to the mic, just above that enormous touchscreen. Two Nintendo Wii Nunchuk-esque convex, clickable analog sticks punctuate the left and right sides of the GamePad, and the plus and minus buttons (replacing start / select) from the Wiimote sit along the lower right. The SNES' hallmark four-button layout and d-pad line up on either side of the touchscreen just below the analog sticks. This sure is a Nintendo device, eh? Or is it every Nintendo device, all at once? Of course, the GamePad is more than an homage to Nintendo's previous hardware, and there's plenty new to gawk at -- a volume slider controls how loud the GamePad's speakers are, a haloed Home button sits along the bottom (allowing for quick access to the GamePad's settings and the console's main menu) and a red battery light indicates when you'll need a recharge (solid to warn, blinking when death is imminent). 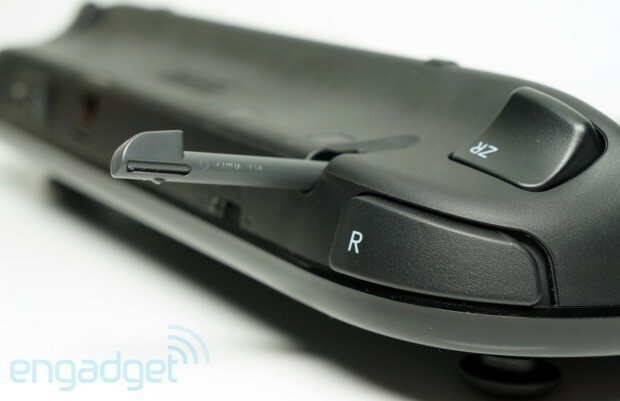 Digital triggers await your pointer fingers on each side around back, with a clickable shoulder button above each (similar to the Xbox 360 and PlayStation 3 controllers). A deep ridge allows you to comfortably hold the hefty, 1.1-pound controller for long periods -- not that you'll be using it for much longer than three hours if you don't plug it in. We pulled just under five hours out of it with brightness turned all the way down, the sound off and no rumble, but averaged around 3.5 hours in general use. There's also a power-saving mode which auto-adjusts the screen's brightness based on whatever it's displaying, which seemed to do little in conserving battery life; turning down the sound and keeping brightness at the lowest setting is the best way to extend run time beyond the average, we found. Should you choose to give yourself a break and fully recharge the controller, it'll need around 2.5 hours to re-up. We pulled just under five hours out of it with brightness turned all the way down, the sound off and no rumble, but averaged around 3.5 hours in general use. As for new functionality, there's a spot for NFC connectivity, but we can't test it as no software supports it yet (not even Activision megahit series Skylanders). Of course, it's not hard to imagine, say, a Pokémon tie-in down the line, or something else similarly terrifying to parents' wallets. Perhaps the most novel non-gaming function of the tablet-esque controller is its IR-based universal remote control ability -- the GamePad can be used to control your HDTV (well, "most" HDTVs) in some basic, but very important, ways. Rather than futzing with several remote controls to turn on your television and game console, the Wii U's built-in universal remote functionality -- which functions whether or not the Wii U itself is powered on -- streamlines everything down to just the game controller. Of course, this is no replacement for your Harmony One; in our experience, it was primarily used for powering on the Wii U, the television, and switching to the appropriate input / changing volume / etc., and thankfully had little to no impact on battery. This functionality alone made a huge impact on how we approached the console as part of the entertainment center. It's also changed our game playing habits quite a bit, as many games on the GamePad screen are mirror images of the TV -- we found ourselves indulging ADD and flipping to the evening news while trouncing goombas. It also helps the family dynamic of battling for control of one television. Little Sally can keep playing New Super Mario Bros. U while Dad watches Sunday football (or other such situations). Sadly, overall, the GamePad controller gives off a relatively low-grade impression; it looks and feels like a toy. The four main buttons resemble aspirin pills and aren't of the polish we expect from modern game consoles; glossy plus / minus buttons accentuate this tragedy even further. Shallow, squishy shoulder buttons akin to those on Sony's DualShock 3 compare poorly to those found on the current Xbox 360 controller as well as competent third-party equivalents (the Razer Onza, for instance). And the convex analog sticks had our thumbs easily slipping during long Mario sessions. The glossy, handprint-friendly, dust-magnet finish on the GamePad isn't helping its looks, either (we prefer the matte finish on the GamePad's rear). It's not all bad -- the d-pad is as solid as ever, and the clicky digital triggers work beautifully (as long as you're not playing an FPS or a racing game, that is). The GamePad's comfy, too, despite its weight and size. If only it'd go further from its home base console than the 26 feet Nintendo's promising. Yes, we tried bringing the Wii U GamePad everywhere, but Nintendo's (admittedly conservative) estimation is pretty spot-on -- the streamed video that the Wii U pushes to its GamePad wouldn't go very far at all without running into hiccups or cutting out altogether. That isn't to say we encountered issues within that estimated distance -- in fact, streaming worked flawlessly -- but don't expect to sneak in late night gaming from your bedroom while the Wii U sits quietly across the house. Though folks in more rural areas may fare better, our NY-based test apartment with three wireless devices (aside from the Wii U) wouldn't allow anything beyond 20 feet or so. Within that range, though, the Wii U magically streams hiccup-free gaming to both the GamePad's screen and an HDTV -- no small feat, and one that opens up a Pandora's box of ideas for both game developers and media providers. The Pro Controller is a Nintendo-crafted hybrid of the PlayStation 3's DualShock and the Xbox 360's controller. It's got a good heft, but isn't too heavy, and sadly features the same glossy plastic and cheap buttons we've already complained about. Apparently Nintendo wants our consoles and their accessories constantly looking dirty? It rumbles as you'd expect and functions admirably in time-sensitive situations (such as Ninja Gaiden 3). Also expected: its battery lasts much, much longer than the GamePad, with ours holding charge anywhere from six to 10 hours before needing a plug in. Unlike the GamePad, which requires a wall charge directly, you can simply plug in the controller into the console via USB and continue playing while charging. 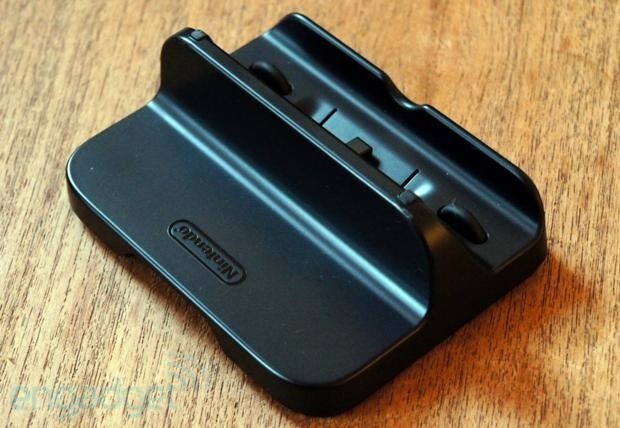 Surprisingly, there's a lot to be said for the convenience of the Wii U's GamePad charging cradle. Rather than fussing with wires that connect to an otherwise wireless console, you simply place the GamePad in a comfy dock, no connection required (a la the 3DS charging cradle). It comes with its own AC adapter and doesn't actually require a physical plug into the GamePad -- the controller charges via touch points rather than a plug (again, in around 2.5 hours). If Nintendo Land's discounted price and the larger internal storage haven't already sold potential buyers on the deluxe Wii U version, the cradle (otherwise sold separately for $20) absolutely should. It's a small convenience, but quite a nice one. We can't share the same positivity about the mostly unchanged UI -- it's a simplified version of the user interface we got to know in the original Wii. Movable, rounded square tiles (five across, three down) represent most of the experience, aside from the ability to swap between your user Mii walking around WaraWara Plaza and the tiles. Logging in with your Mii is a snap, and you can set a particular one to default login on boot. Logging out and switching users is as simple as tapping the user icon in the upper left corner of the UI and selecting another user -- simple, intuitive and quick. Currently, pre-launch update, what little that is available in terms of non-game software loads surprisingly slowly for a brand-new console. Opening the Mii Maker, the System Settings, Daily Log or the Parental Controls requires a roughly 15-second wait while the application loads (yes, we timed it), and backing out takes about as long. When you do enter any of the applications, there's only so much to do -- the Mii Maker functions much like that of its 3DS equivalent, matching up a camera scan of your face with an approximation or allowing you to import one from other Nintendo consoles (3DS included). You can also create your own from scratch, should you be so inclined. The Daily Log shows a breakdown of your daily actions on the Wii U, as well as per game, so you can find out exactly how much of your life you've spent trying to find various incarnations of the Triforce. 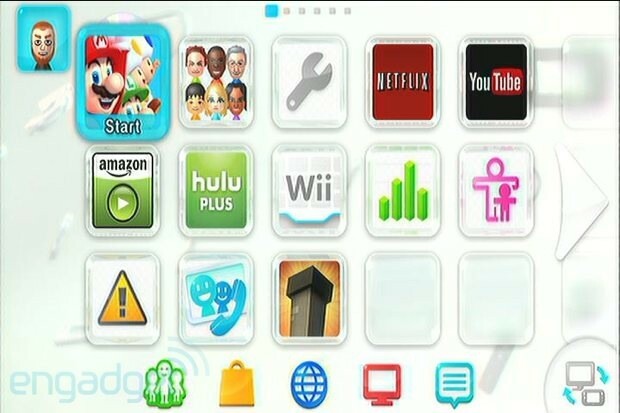 Parental Controls mostly allow for enabling or disabling the Wii U's various features -- accessing non-game entertainment, or Miiverse, or the eShop -- as well as an ESRB-based blocking system for games. System Settings is where you'll go for data management (such as transferring your old Wii data over), but also where you'll go to tweak the settings you arranged in initial setup (wireless networks, date/time, etc. -- basic system level stuff). Most importantly, it's where you can recalibrate your GamePad and sensor bar should there ever be an issue. 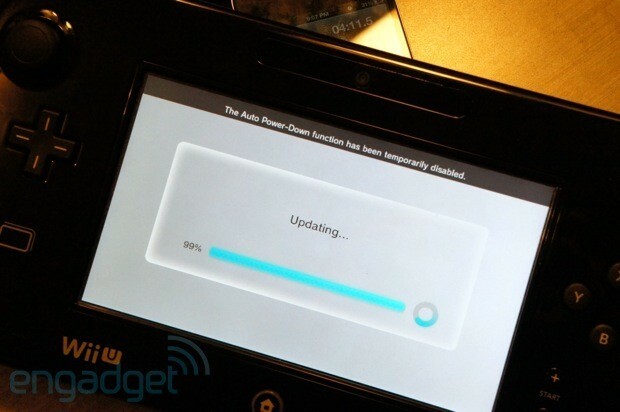 Here's hoping you've got a strong internet connection, as the first thing Nintendo hopes you do with your Wii U is download a massive firmware update. Beyond just a slew of online services (Miiverse, Nintendo Network, the eShop, an internet browser, Wii U chat and Netflix), the update adds the ability to use external storage (up to 2TB) and play original Wii games. Kind of a big deal! As such, we've spent the past two days exploring all that new functionality. Part Twitter-alike, part forums, Miiverse is the path to meeting new online friends who share your interests and bragging to existing ones about your accomplishments. The network is divided into forums based on existing software (including a Netflix forum) and it's moderated pretty heavily. You'll see lewd drawings pop up now and again (yes, you can draw black-and-white images), but it's impressive how civil the discourse has become since launch. Some games suggest posting in the Miiverse after a particular accomplishment (New Super Mario Bros. U prompts that posting almost constantly, so you may want to adjust your settings accordingly). Sadly, the service's social functionality barely scratches the surface of what most social networks offer. Profiles are shallow and offer little tie-in with the service's own namesake, Nintendo's Miis (outside of WaraWara Plaza, but we'll get to that in a moment). Worse, none of the system's similar functionality works in-tandem with Miiverse -- video chat is an entirely separate application, as is the Friends List. Even a simple thing like system-wide in-game screenshots or video that could be shared aren't present -- concepts already delivered on several competing consoles. Another function of the Miiverse is sending friend requests -- Nintendo thankfully replaced its clunky "friend code" system with a much simpler concept: the Nintendo Network ID. When you first sign into your local WiFi network, the Wii U prompts users to set up the NNID. It's essentially identical to Microsoft's "Gamertag" concept. Bizarrely, the Wii U's friends list (separate from Miiverse) doesn't allow for direct friend requests to be sent; instead, you can "register" friends within the friends list who can then "register" your name, thus making you both friends. At no point does the Wii U actually tell either party that the other person registered you. You can, however, send a direct friend request by looking up a friend's profile in the Miiverse. Making things even more confusing, you're allowed to "follow" 1,000 people on Miiverse, but only allowed 100 "friends." Following someone simply means you'll see their updates in Miiverse, whereas being friends allows for online multiplayer, Wii U Chat and more. It's a distinction you have to figure out for yourself, and it's poorly implemented -- in so many words, the friends / followers situation is a total mess. 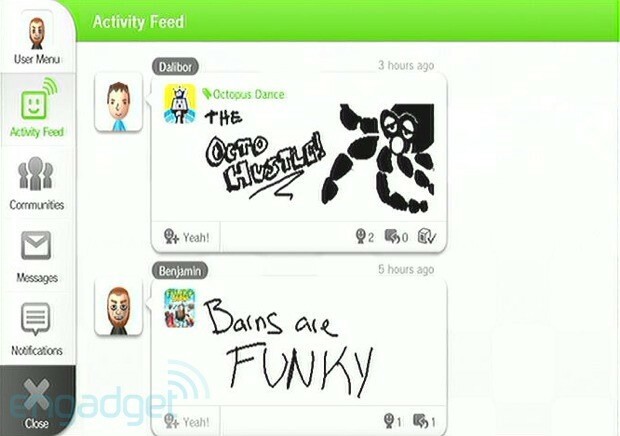 We like using Miiverse, and we like using the Friends List, but their interoperability needs to be hammered out. Quickly. 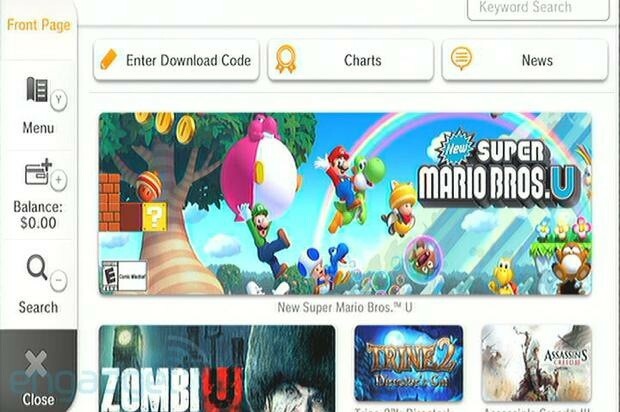 The eShop is the only one of the additions included in the Wii U update that we're universally positive on. It's a huge (huge) step up from the 3DS' eShop, and purchases are a snap. More importantly, the storefront is full of great featured content (including many major retail games -- a bold move on the digital front) and search is quick and easy. Navigation is all handled, like Miiverse, via several contextual virtual buttons along the left side of the screen. The main area is comprised of hotlinks directly to game pages or various game categories -- there's even a prominent indies section. The charts section is the eShop's only real failing, as it's currently busted. We can't imagine it'll stay that way forever, of course. Game consoles are notorious for terrible web browsing experiences. The Xbox 360's recent addition of Internet Explorer is no exception, and both the PlayStation 3 and Nintendo Wii are no better. While the Wii U's browser is vastly superior to its competition (it's speedy and features tab browsing, bookmarks and built-in Google / Yahoo search), it's no match for using a browser on a computer or tablet. Heck, it's not even a good replacement for web browsing on most smartphones. The Wii U's browser will work in a pinch mid-game, but it's not what we'd call ideal for anything longer than a few minutes. Wii U's video chat functionality is a fun diversion, but little more. Calls must be prearranged, as there's no system-level way of knowing you're getting rung unless you're already loaded into the application. If someone on your Friend List isn't around, you sadly can't leave a message (though it thankfully records the missed connection in your buddy's Miiverse notifications, as well as in the Wii U Chat app). It also can't be used to send video messages directly. When you do get on a call, you've got a few basic options for directing where each person's visage is displayed, as well as the ability to draw on each person's face in a variety of colors. Stills can't be grabbed from within the video, nor can entire videos be saved directly to Wii U storage. Again: fun diversion, but little more. Offering what is essentially a virtual Wii console built into the UI is perhaps a strange way to handle backwards compatibility on the Wii U, but it works without issue. Well, one issue: the system requires a full restart to use the Wii's functionality (including its Virtual Console, Wii Shop Channel and Wii System Transfer application). The same can be said for returning to the Wii U dashboard, with a full 30-second switchover each time. If you want to play your Wii games on Wii U, you'd better really want to play them. And no, despite all logic, you can't bring any Wii content over and play Virtual Console / WiiWare games right through your Wii U dash. You'll still have to load into the virtual Wii for disc-based Wii games, and even digital ones. Though WaraWara Plaza wasn't specifically part of the launch day update, it's finally come to life with the addition of various social features and, more importantly, other humans. 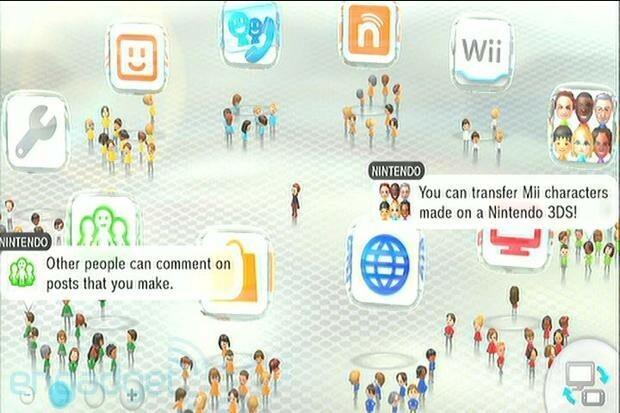 Miis flood the plaza, flocking to a handful of different game-based areas, with content floating above actual peoples' Miis based on what they've posted to the Miiverse. If nothing else, WaraWara Plaza makes the Wii U feel like a truly connected console, and does a great job of showcasing what the greater Wii U-owning public is playing at the moment. It seems like an area ripe for "discovery" experiences -- like budding sketch artists drawing followings from people seeing their work and then zooming in on that Mii and "following" them in Miiverse. The Plaza also serves as a perfect excuse to leave your Wii U on even when you're not playing games -- something Nintendo assuredly hopes you'll do. WaraWara Plaza is one of several small but important steps Nintendo's taking with the Wii U in bridging the gap between us geezers and the generation that grew up with Facebook. There's no excuse for the lazy execution of Netflix on Wii U. It's as slow as ever to navigate (and load, like most Wii U apps), and the second-screen functionality can only be described as barely there. Outside of basic pause / play / etc. 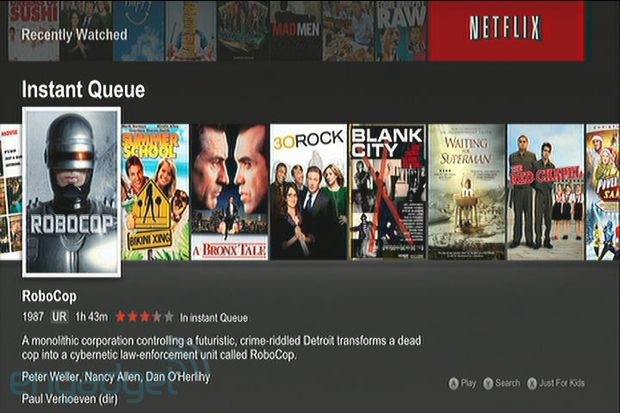 functionality, the GamePad displays information about whatever you're watching but won't allow browsing of the Netflix library, or queuing up what you'd like to watch next, or ... well, anything beyond very basic functionality. Yes, you can pull down video and watch it right on the screen -- pretty neat, but something that many handhelds already accomplish swimmingly. That a 6.2-inch touchscreen game controller is going more or less un-utilized by Netflix is incredibly disappointing. With 23 games to choose from this weekend and even more in the "launch window" (ending March 31, 2013), the Wii U's arriving at retail with a huge presence. Of course, only a small handful of those 23 are worth plunking down your $60 for -- they're still launch titles, after all -- and we've got a few suggestions. Obvious? Yes. Delightful? Also yes. New Super Mario Bros. U is Mario's first big HD outing, and he's looking incredible, as are Bowser's airships and Yoshi's big, goofy face. 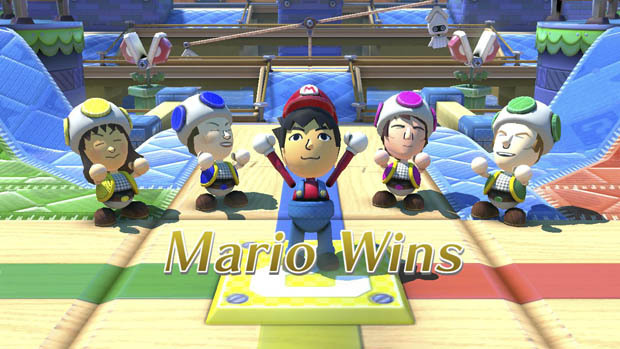 Beyond being a great showpiece for your new console, NSMBU is an excellent Mario game. It's nowhere near as innovative as series standouts like Super Mario World (an SNES launch title) or even Super Mario 64 (an N64 launch title), but it's a heck of a lot better than recent NSMB entries (we're looking at you, New Super Mario Bros. 2 on 3DS). If you're wondering what the Wii Sports of Wii U is, Nintendo Land is it: the game serves as a glorious demonstration of the unique controller's many, many functions, and offers a preview of what other creative ideas will assuredly spring up over the next several years. More importantly, Nintendo Land helps prove that the GamePad's more than just a mixed bag of legacy functionality and emerging tablet fads -- the tilt sensor shines in Captain Falcon's Twister Race, and the whole "second screen" idea works beautifully in Luigi's Ghost Mansion. It's easy to forget how cheap the overall build of the GamePad feels when you're enjoying totally new gaming experiences with it. Nintendo Land's demonstrative abilities are a necessity when buying the new console -- the game alone sells the deluxe set, as you'd pay more for the game and regular bundle separately. 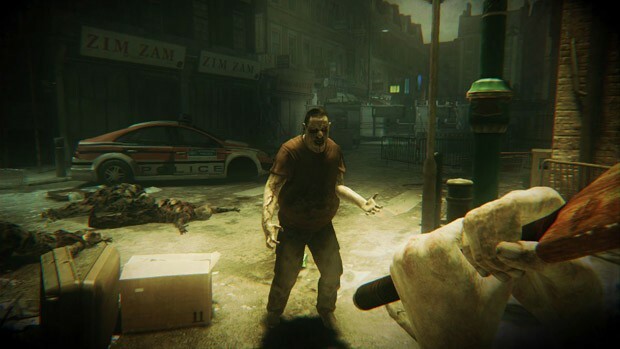 Ubisoft Montpellier's long-in-development Wii U zombie shooter matured considerably since its initial unveiling as "Killer Freaks From Outer Space." The freaks are now the undead hordes of London, post-zombie apocalypse, and you're an unwitting survivor struggling to hang on. Rather than gleefully taking to heavy weaponry, you'll be employing survival skills more than anything else -- weapons (and ammunition) are at a minimum, and the GamePad's second screen is employed smartly as a map / backpack (as well as lots of other neat tricks that you should really just see for yourself). ZombiU also serves as a showcase of the system's non-cartoon HD ability (some up-close textures reminded us this is still a launch game, sadly). Be warned that it is also relatively terrifying, though we scare easy. Wii U's launching with a variety of ports from current Xbox 360 and PlayStation 3 games, such as Mass Effect 3 and Assassin's Creed 3. The vast majority of this holiday's big games are being ported (as well as some of last holiday's, like Batman: Arkham City Armored Edition). None of these are developed with the Wii U in mind, though some have additional content or new ways of interacting with existing content. If you're dead set on only playing Wii U games this holiday, then these might be your only way to check out some great games. That said, there's little benefit to playing them here over other consoles -- and if you're into multiplayer, there's an argument for existing consoles having more online players (based solely on install base). Nintendo promised consumers a modern HD gaming console, and the Wii U delivers on that promise ... in some respects. Games look gorgeous (HD Mario! ); the risky controller is another successful control innovation; and there's a ton of promise on the horizon. But there are also some major missteps and half-baked ideas: a befuddling Friends List/Miiverse connection, a complete lack of many system-wide console standards (group chat, achievements, the ability to play non-game disc-based media) and a game controller that lasts only 3.5 hours. 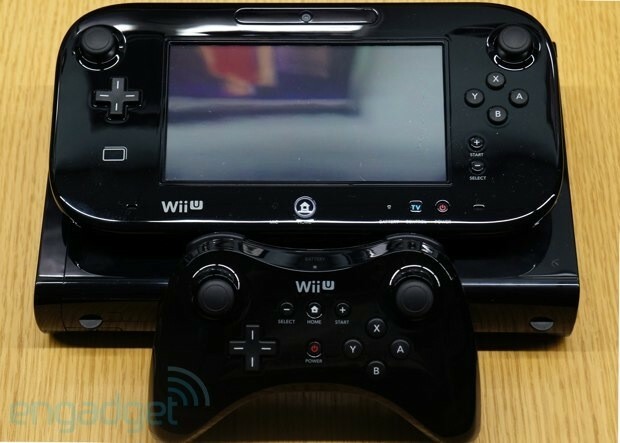 It's for these myriad reasons that we can't suggest buying Nintendo's Wii U just yet. It's a complex, innovative console that feels a few months short of prime time -- what's there is compelling, but its novelty will likely wear off with folks used to their consoles doubling as media centers; Nintendo promises its TVii functionality will launch next month, which could change this equation dramatically. For now, it won't hurt to wait a month or two until the stocks replenish and Nintendo finishes its launch. Update: Nintendo delayed TVii into December, and the majority of promised functionality was not made available to reviewers ahead of the console's November 18th release date (including crucial components like online infrastructure, the Miiverse social network, Nintendo Network, Nintendo TVii, and Wii backwards compatibility). Today, two days after launch, we've finalized this review with a post-firmware update segment, our final video review and our final words on the Wii U. We appreciate your patience! Joseph Volpe contributed to this review.